Part Studio tabs are where you begin modeling and creating parts. All parts begin as sketches, using sketch tools, and then, in the same Part Studio, you use feature tools to create part (solid bodies) from the sketches. You can create as many Part Studios in a document as you wish, and create as many parts in a Part Studio as you wish (though we recommend keeping the parts in a Part Studio limited to those that are geometrically relevant to each other) for the best performance. This topic explains how to customize the toolbars in Part Studio and Assembly tabs, as well as the functionality and mechanics of using Part Studios to create parts. Access the shortcut toolbar with the S key while in a Part Studio, Drawing or Assembly tab. An example of a sketch tool shortcut toolbar. Customize your shortcut toolbars in your Account preferences. 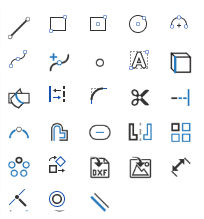 Click Save to save your changes, Cancel to close without saving, or Reset to default to undo all changes in that type of toolbar (Part Studio, Assembly, or Feature Studio) and restore the toolbar to Onshape original order and content. When tools are part of a group, you must move the entire group. Once an entire group is removed, you can select individual tools to move back to the toolbar, if desired. To reform the entire group, select Reset to default, which will reset the entire toolbar. When you first enter a Part Studio, the Feature toolbar is shown. Most new parts begin with a sketch. To start sketching, first select the Create new sketch tool in the Feature toolbar, displayed above outlined in blue. The top margin (Navigation bar) of the Onshape document contains the name of the document (in bold) and the active workspace name to its right. The Feature list contains the default geometry as well as any features you create. The thick bar is the Rollback bar and has the ability to be repositioned to generate the Feature list up to its location in the list. At the bottom of this panel is the Parts/Curves/Surfaces lists (referred to commonly as the Parts list). These lists are collapsible for your convenience. For example, :part part 1 will show all features that directly affect Part 1. 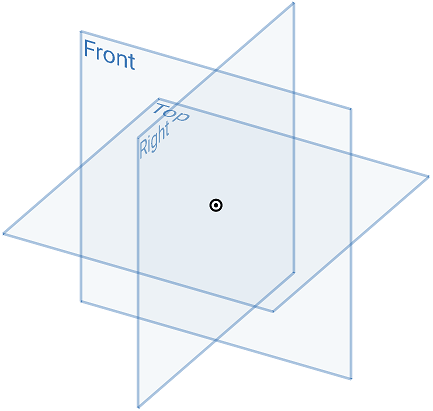 The default geometry (origin and planes). The Tab manager area: all Part Studios, Assemblies, Drawings, imported images and other files. These tabs can be dragged for repositioning, and each has its own context menu (RMB to access). Tab search - Open the Tab search panel to search for a tab by name, or locate using the thumbnail image. Insert new element - Open the menu from which to create a new tab, including: Part Studio, Assembly, Drawing, Feature Studio, folder. Use this menu to also initiate a file import and add a third-party application. When the window is smaller, the Sketch tool may be resized to . For more information about sketching, see Sketch Tools. 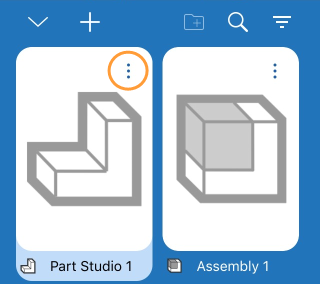 To learn more about creating multiple parts in one Part Studio, you can follow the self-paced course here: Multi-Part Part Studios (opens in new tab). Properties that are grayed out (inactive) are defined and populated through the Company’s properties in Account management. See Manage Companies > Properties for more information. Show code - Open a panel with the FeatureScript displayed. Duplicate - Make an immediate copy of this Part Studio. Copies are pasted directly to the original Part Studio. Copies have no association with the original. Copy to clipboard - Copy a Part Studio to the clipboard in order to paste into another document. Open another Onshape document, click (Insert new element) and select Paste tab to paste the copied tab into a different document. 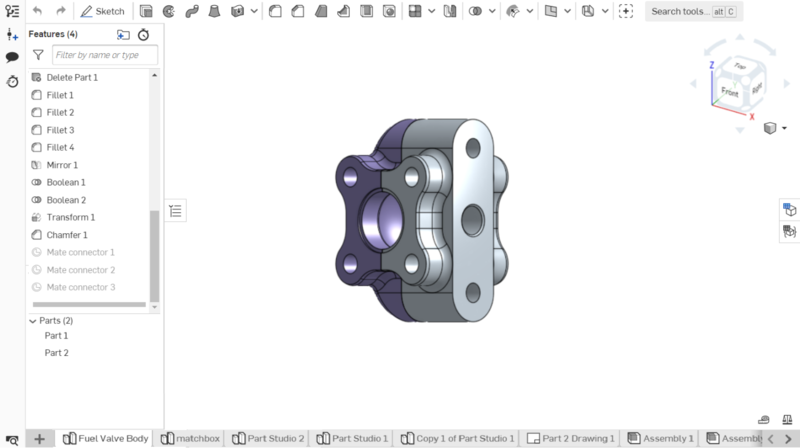 Create drawing of Part Studio x - Automatically create a drawing of the entire Part Studio (solid bodies/parts only). This creates a new Drawings tab in the document. Move to document - Move the Part Studio to a new or existing document, creating the new document during this operation. If any part is used in any tab of the original document, a link between the two documents is created and represented in the Feature list with these icons: a link exists; a new version of the document is available. To update to a newer version, click the icon to open the Reference Manager. Export - Export parts in the Part Studio in a variety of formats with options of where to download or keep in a separate Onshape tab. Delete - the Part Studio (or any tab), even if it is active. The last remaining tab cannot be deleted. 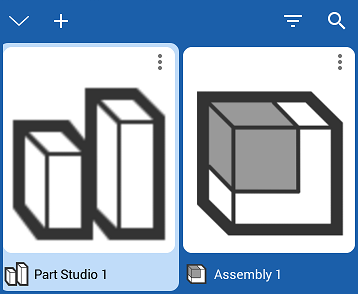 Newly created documents contain an empty Part Studio and Assembly by default. 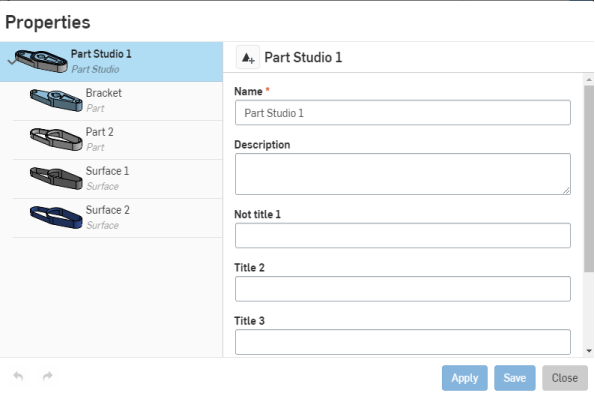 A Part Studio is used to define parts and has a Feature list (parametric history). One Feature list drives the shape of multiple parts. Use Sketch tools to create 2D geometry, and use Feature tools to create 3D models (or parts) from those sketches, all within a Part Studio. In a Part Studio, along the top of the screen is the navigation bar. The navigation bar holds a number of tools that varies based on your device's screen width or orientation. Any tools that do not fit due to screen width will be found in the Document information panel. To close the document and return to the documents page, tap the arrow in the upper left corner. To create immutable versions and branch versions to create new workspaces, tap the Versions icon in the upper left. See Version Manager for more info. Tap the icon in the upper left. See History for more info. To communicate with collaborators, tap the Comments icon in the upper right. To see who you are collaborating with and to access Follow mode, tap the Collaborators icon in the upper right. See Collaboration and Follow mode for more info. The Collaborators icon is only available when you are collaborating with someone in real time. To access the Help and other resources such as Videos, Feedback, and About, tap the icon in the upper right. Help - to view the documentation for the device you are using. Videos - open the videos page of the documentation. Feedback - ask a question, log a bug, or log an improvement. About - see which version of Onshape you are running. 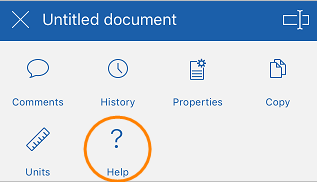 Access the Document information panel which allows you access to any tools (listed above) that do not fit in the navigation bar as well as some other tools listed below. 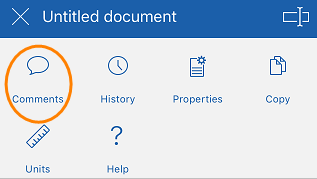 To access the Document information panel, tap the More icon in the upper right corner. Properties - to view document properties. Copy - to make a copy of the workspace you are in. Units - to view and set default measurement units for the document (such as length, angle, and mass units). Document name - tap the edit icon in the upper right corner to edit the document name. Document description - tap Add description to add or edit the document description. Share - tap the share icon to share the document with individuals, Teams, Companies, or Onshape support. You are also able to set your document to Private or Public. Tap the New Sketch tool icon to select a plane and start a new sketch. With a sketch open, tap the New Sketch tool icon to view all of the sketch tools. See Sketch tools for more info. Tap the Feature tools icon to view all of the Feature tools. See Feature tools for more info. Tap the Measure tool to measure any selected entities. See Measure tool for more info. Tap the Mass Properties tool to view the properties of selected parts. See Mass Properties for more info. Tap the Feature list handle to open the Feature list. Touch and drag horizontally or vertically to adjust the size of the Feature list. See Feature list for more info. Tap the 3D Rotate lock button to lock the graphics area rotate feature. This is particularly helpful when trying to drag an entity. See 3D Rotate Lock for more info. Tap the View cube to access a list of view to choose from. See View Cube for more info. Every Part Studio, by default, has three planes (Top, Front, Right) and an Origin to be used a reference points when sketching or creating a feature. You have the ability to create as many planes as you like. You have the ability to hide the default planes and Origin from view via the Feature list, but you are not able to delete them. When you open a document, the most recently opened tab is active. Tap the up-facing chevron (up arrow) to open the Create tab menu. Tap a tab to activate it. When you switch tabs, any open feature will be committed. Swipe left or right to scroll, horizontally, through the list. 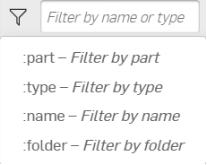 Filter tabs by Assembly or Part Studio. Search for a Part Studio or Assembly by name. 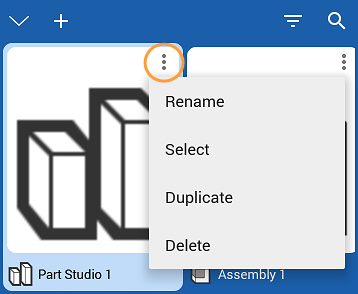 Create, rename, duplicate, and delete a Part Studio or Assembly. There is no limit to how many Part Studios or Assemblies a document may have. Duplicate adds a copy of a Part Studio within the document. You are not able to delete a Part Studio or Assembly if it is the only tab in the document. A document must have at least one Part Studio or Assembly (at least one tab). After opening the menu, tap Select. This select the current tab to be included in the folder, and puts a check mark on other tabs so you can select them. Select any other tab to be included in the folder. Supply a name for the folder. Select the All tabs icon (second icon from the left, above) to display all tabs again. Rename - Edit the folder name. Select - Select a folder to then create another folder in which to place that folder. Unpack - Delete the folder and place the tabs back in their original position. Tap the More icon to access the Document information panel. To see who you are collaborating with, tap the Collaborators icon in the upper right. See Collaboration for more info. Document name - tap the pencil icon in the upper right corner to edit the document name. Document description - tap the pencil icon to add or edit the document description.